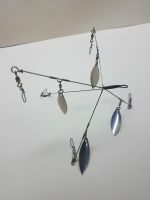 3 Arm RIG with Premium 0.040 SUPER BROWN Stainless Steel wire and 6 Blades. Arms are approximately 6.25 inches long. 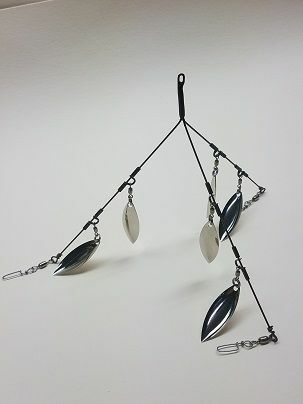 One of our LATEST RIGS that really ATTRACTS the fish with all of the FLASH from Blades. Comes equipped with a 75 pound test crane swivels from Rosco® with a coastlock clip. The arms have 2 Nickel Brass Blades on each arm. Blades are size 3.5 (1.56"). Rig is 100% USA materials. We have sold over 25,000 rigs on eBay, our website and Direct. We also CUSTOMbuild to customers specifications. We have 0.035, 0.041, 0.045, 0.051 and 0.0625 wire available. There is NO bulky head up front since the rig is headless using our Brazing technique to assemble the wires. Testing shows there was not any difference in the size or number of fish caught with or without some fancy head on the rig. We are now installing a Brass Collar below the braze to allow a bending point away from the braze to reduce or eliminate any breakage. Arkansas residents are subject to sales tax. Be sure your shipping info is correct as our labels print automatically from the addresses you have on file.